Big Boy Classic .44 Mag. Henry rifles… utter the phrase and even the most novice firearms enthusiast knows of what you speak. It’s brass and hardwood and lever-actions and a good dash of the old west. Tried and true performance and perhaps more fun than might be legally advisable. The New Jersey-based company has become legendary in a relatively short amount of time. Just a quarter century that’s all the gunmaker has been around. But in an industry that tends to measure longevity in half and full centuries, it’s a blink of an eye. And Henry’s success, in many respects, came against the odds. Always steeped in old-style firearms, Louis Imperato started the company as a manufacturer of replica black powder revolvers in Brooklyn, NY in 1993. Acquiring the rights to the Henry Repeating Arms brand name soon after with his son and long-time company president, Anthony, the company soul product was what is now known as the Classic Lever-Action .22. Black powder and lever-actions, gutsy choices in the go-go 1990s and right on target. Striking a nerve with the American shooting public, those humble roots blossomed into one of the country’s most substantial gun manufactures. Now, Henry Repeating Arms are made in two states (New Jersey and Wisconsin), has roughly 250,000 sq. ft. of manufacturing space and employs more than 475 people. Furthermore, they turn out everything from rifles, shotguns even pistols (yes, the Mare’s Leg is considered a pistol) in lever-action, semi-auto, single-shot, even pump action. The gunmaker even dusted off the old 1860 Henry Rifle design in recent years, truly helping it live up to its name. Impressive, still for many one thing will always come to mind when talking Henry and that’s Henry rifles. And like any Titan, the company has produced some must-have models over the years. So, without further ado, here’s a look at five Henry rifles no gun safe is truly complete without. Chance meetings with coastal browns or big timber bull elk, you might not find better medicine than the .45-70 Government. Furthermore, it’s arguable Henry’s All-Weather Lever-Action is the ideal delivery system. Configured as a guide gun, the 18-inch barreled rifle is nimble as they come allowing shooters to deliver 300 to 500 grains of heavy metal to a target in a snap. A semi-buckhorn rear sight aids in the task, especially with a diamond insert that draws the eye intuitively to the notch, while also providing the capability of more precise work at distance. Furthermore, the rifle comes drilled and tapped, so adding a scope requires minimal effort. Users demanded it and Henry listened. A newish addition and a break in design from traditional Henry rifles, the Long Ranger has succeeded wildly in its charge. As its name suggests, the rifle aims to extend the range of Henry’s lever-actions, which forced the company to reevaluate how they’d tackle the platform. The receiver is longer, made of aluminum and features a six-lug rotating bolt, as well as a removable box magazine. The results are more than respectable, given the Long Ranger is capable of MOA performance with the benefit of lever-action speed. The nice part, Henry didn’t compromise in creating what is fast becoming a shooter favorite. Despite the modernization, the Long Ranger is completely American made and retains the attractive lines common to Henry rifles. To the latter point, the rifle’s straight grip, excellent walnut stock and sharp checkering (fore-end and grip) go a long way towards this end. Available with or without iron sights, in either case, the rifle comes drilled and tapped, so adding a scope is no fuss, no muss. Might it be the finest .22 LR to ever come down the pike? There’s certainly a case for it. Even if it didn’t happen to boil down the “Best,” there’s still no denying the Golden Boy is a hell of a fun gun to run. From Hollywood cowboy good looks to fast action, and of course accuracy, the brass-frame rimfire has and continues to mesmerize shooters of all ages. Why not? In practiced hands, the 20-inch octagon barreled lever-action is nearly as fast as any semi-auto out there and, with rich walnut, is more attractive than most of that lot. Easy to see why the Golden Boy is among the most popular of all Henry rifles. Pistol-caliber long guns tend to raise some shooters’ hackles. But Henry’s Big Boy line of lever-actions smashes most of their objections. 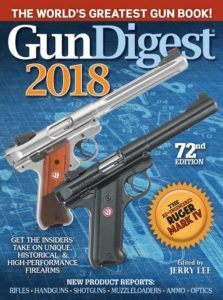 Chambered in a wide selection handgun magnums, the rifle is plenty powerful, in many cases substantially enhancing a cartridge’s ballistics compared to a revolver. How much more? In the neighborhood of 300 to 400 fps, when making the jump from a 4-inch barreled handgun to an 18-inch barreled rifle. In the end, you’re left with a manageable firearm with the chops to defend your home and put meat on the table On top of that, with the Big Boy you’ll look good doing so. The most practical of all Henry rifles, the AR-7 has lifesaving potential. Designed by Eugen Stoner as a survival gun and optimized to provide rugged performance no matter the circumstances, the semi-automatic stays at hand wherever you might venture. The bugger is only 3.5 pounds and, when broken down and stowed in the buttstock, roughly 16-inches in length. That compact, it’s ideal to stow in a rucksack for a deep backcountry trek or as an emergency gun in a boat, car or camper. Additionally, the AR-7’s weight, or lack thereof, means you can pack in more ammo – never a bad idea. Were we on target with our Henry rifle picks? Do you have favorite in the list? What gem did we miss. Tell us in the comments below.